God, Timing, and Saudi Arabia | Come believe with me. Today I went to a park to talk with God. I felt I should go to a certain park I’d never been to before. I was there over an hour, hashing out some things with the One Who knows me best. It was getting cold. I wanted to go. There was a pause in my spirit, “Don’t leave until 4pm.” It was 3:40. Again, I was cold. I wanted to go, but I felt the Holy Spirit was doing something so, I lingered. Right after 4pm I left. While driving home I saw a friend walking. I passed her and then felt I needed to turn around and offer her a ride. I did. She got in the car and said, “This is interesting because I was thinking about you a couple days ago and wondering where you were and if you were back in Iraq yet.” She asked about my trip. I began to tell her a story. She interjected with, “Yeah, that’s like when I was in Saudi Arabia.” “What?! When were you in Saudi?” I asked. She went on to explain how she lived there three years before 9/11. It was not merely shocking that she lived in Saudi. It was shocking because one of the last things I talked to God about at the park was an opportunity I have to take a team to Saudi in May. I REALLY want to go and see the Kingdom of Saudi Arabia fall in love with the true King. From there she thanked me for going to Iraq and being faithful to fulfill what God was calling me to. Tears came to her eyes, and to mine. She said she would be praying for me. I thanked her and dropped her off at her destination. I don’t know how God choreographs things like that, but I appreciate it. In fact, I really don’t understand a lot of things in my life right now: massive miracles splashed against massive challenges. My pastor, Bill Johnson, says, “If you want peace that passes understanding you have to give up your right to understand.” That is one of my favorite sentences. I think a lot of times we aren’t willing to step out in faith because we are afraid of failing, looking stupid, getting rejected, being misunderstood, and sometimes we’re mainly afraid of disappointment and loneliness. Personally, I am really thankful for all the years of painful stretching, radical belief, and sacrificial living. I have had the opportunity to ascend into higher levels of truth and deeper levels of love. Moreover, I’ve had so many moments like today when God has blown my boxes to smithereens yet again. He is 100% faithful. It does NOT matter what your circumstances look like. In fact, the more we learn to focus on the unseen and what God is doing behind the scenes, the more we will see it manifest in the physical. What you focus on grows. Your thoughts and words are powerful. Closing thoughts: for me, I dream that today’s road takes me to Saudi Arabia soon. I dream that it takes you to your destiny full of joy and power. 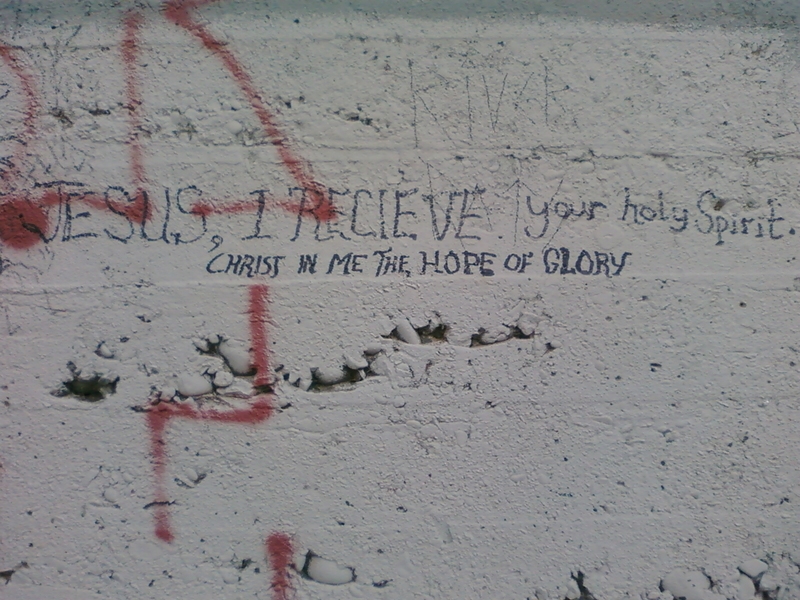 Humorously, this is the graffiti on the wall next to my niche at the park today. Eerily wonderful.